PV monitoring software and hardware are slowly becoming decoupled in most markets around the world, creating opportunities for a new breed of monitoring firms. GTM Research unpacks the latest trends in solar plant operations and management. 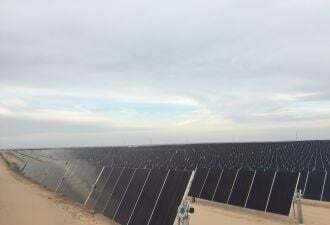 Historically, PV monitoring vendors developed fully integrated solutions, including both on-site hardware to acquire the data and remote software to collect, process and present it. While this one-stop-shop approach to data acquisition and presentation remains dominant, it is increasingly getting challenged by a new model: hardware-independent data aggregation. In nascent markets, plant operators and owners tend to standardize on one monitoring solution (hardware and software) that fits their needs. When markets mature, however, things tend to get messy. Some vendors disappear, get acquired, or become less competitive. Projects get sold. O&M providers manage heterogeneous portfolios of PV systems and find themselves using multiple monitoring software solutions, sometimes more than 10. Data gets scattered. Plant supervision and reporting become complex and inconsistent. Costs increase and efficiency decreases. Monitoring aggregation solutions are designed to integrate with a variety of other monitoring platforms, bring all the data under one roof, and offer a consistent interface for supervision and reporting. In each major global market or region, at least one hardware-agnostic monitoring aggregation software platform vendor seems to thrive and chip away market share from the traditional monitoring firms. Such disrupters include 3E and QOS Energy in Europe, and Power Factors and Krypton in the U.S., to name only a few. The trend does not stop there. Recognizing the evolving needs of their customers and the threat posed by this new wave of competitors, traditional monitoring providers are evolving. 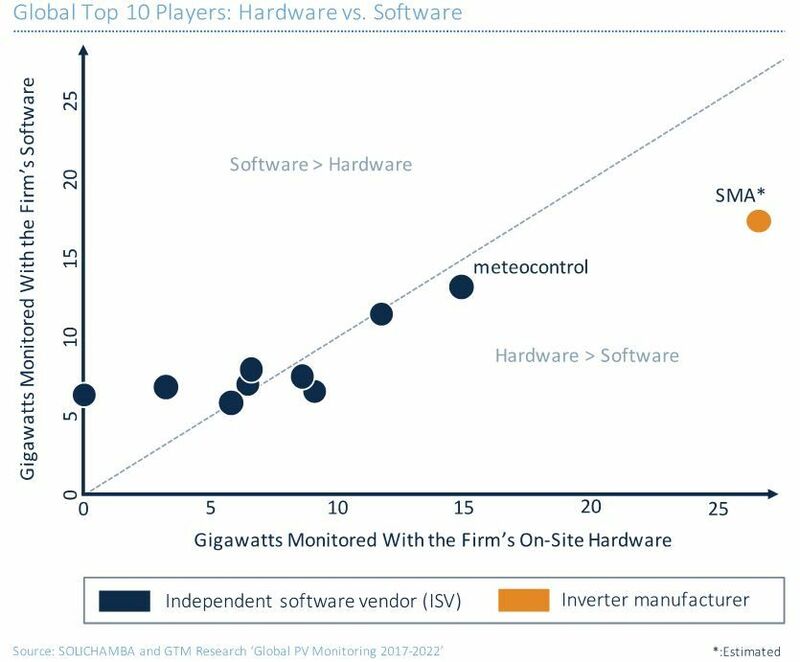 Meteocontrol, the top independent monitoring vendor in the world per the new GTM Research report, currently aggregates data from 3 gigawatts' worth of plants monitored by its competitors’ hardware, in addition to 10 gigawatts monitored by its full hardware and software stack. The company’s hardware is deployed on another 5 gigawatts of plants managed by other company's software. In the Global PV Monitoring 2017-2022 report, GTM Research and Solichamba find that most of the top monitoring players still rely on the traditional business model of deploying both hardware and software, as shown below, where seven of the top 10 firms deploy hardware and software in almost identical amounts. The GTM report also finds that the top monitoring aggregation providers are growing at a faster pace than their traditional hardware/software competitors. 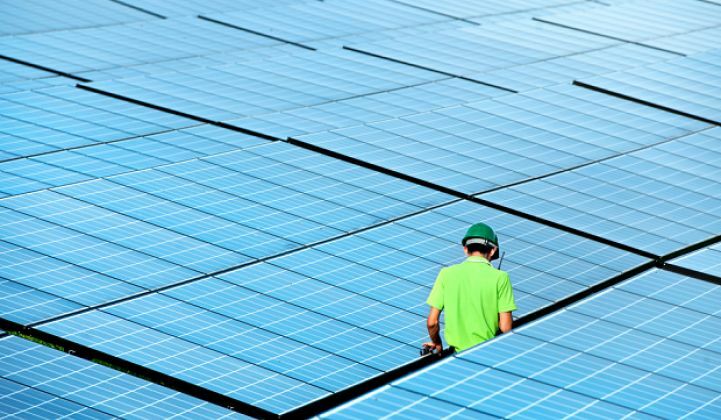 As more markets mature around the world, we can expect the PV monitoring market to continue its transition toward a separation between local hardware and remote software solutions. 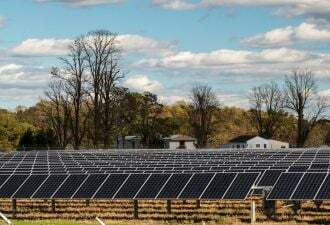 For global and country-by-country PV monitoring trends, market forecasts, and competitive landscape analysis by segment and country, please refer to the new GTM Research report: Global PV Monitoring 2017-2022: Markets, Trends and Leading Players.